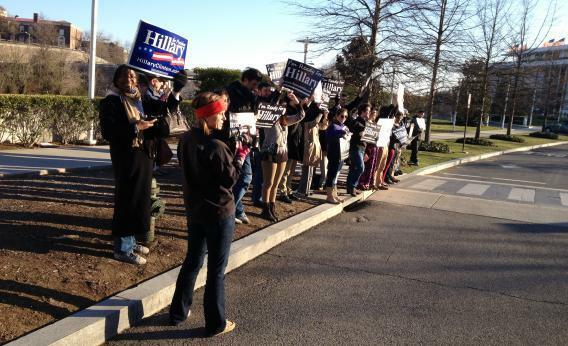 Hillary 2016: Supporters rally outside Clinton speech at Kennedy Center. Supporters of the Ready for Hillary PAC rallied outside Washington’s John F. Kennedy Center for the Performing Arts Tuesday night, where Hillary Clinton made her first public appearance since stepping down as Secretary of State. About 35 people showed up Tuesday night outside Washington’s John F. Kennedy Center for the Performing Arts, where Hillary Clinton was making her first public appearance since stepping down as Secretary of State. Coincidentally, it was also the first public appearance for the Ready for Hillary PAC, which you can and should read more about here. I asked a few of the group’s members what brought them out on a chilly April evening two years and eight months ahead of the Iowa caucuses. Most Eager: Just look at those two. Best Historic Campaign Cred: Lynn campaigned for Geraldine Ferraro in 1984. Best Overall Campaign Cred: Hazel was a delegate in 2008, representing Virginia’s 8th congressional district. Most Die-Hard Hillary Supporter: A supporter since 1991, Ronda worked at Hillary’s campaign headquarters up through the last day of the 2008 primary, but never campaigned for Obama. She made sure to bring her 2008 yard sign.